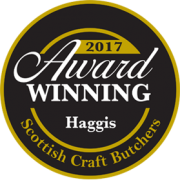 We are a family-run butchers, established in 1950 and currently on our 3rd generation, and pride ourselves on the quality of produce which we sell, from specialty rare breeds to a range of local meats. We believe in providing the best possible quality meats to our customers: we stock meat from a wide range of local suppliers, with fresh supplies coming every day. 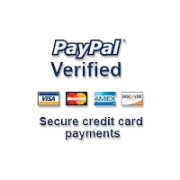 As well as our thriving shop, we run a comprehensive delivery service too. With links to William Wallace, Robert the Bruce, Bonnie Prince Charlie and his Jacobites, Dumfries underplays its significance in Scottish history. It was the birthplace of motor racing’s Alan McNish and David Coulthard and many famous stage and screen personalities including Kirsty Wark. It was also the hometown of the Robert Burns from 1791 until his death in 1796 and although the national bard was laid to rest in St. Michael’s Churchyard in the Burns Mausoleum nothing alerts you to any of this as you arrive in Dumfries. 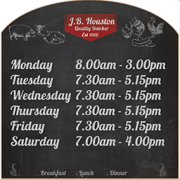 In much the same way, JB Houston’s butchers stands back off the Lockerbie Road, much loved by its loyal trade but modestly understating its fabulous products. Stuart Houston, is the third generation of his family to run the business since J B Houston was established in 1950 by his grandfather, Bert ‘Kiddie’ Houston. Stuart’s dad was next to take on the business and Stuart has worked in the firm for 33 years. Before you even enter the shop, first time visitors have to be surprised by its location since this is no town centre site but based on edge of town in Greenbrae Loaning. Stuart knocked down a four bedroom house next to the shop four years ago to make way for a much needed customer car park and that creates a valuable feature in times when customers are so car reliant. Serving the town of Dumfries with its population of 43,000 and a considerable catchment area extending for miles around, J B Houston is a special butchers well stocked with a full range of meats; beef and pork suppliers are Millers of Speyside and Scotch Premier, lamb is from the local abattoir at Lockerbie and two dozen kitchen ready products, an interesting variety of speciality sausages, their own award winning bacon, pies and black pudding compliment all that. 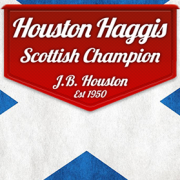 However, hand made haggis is what Houston’s are renowned for. From London restaurants to celebrity chefs, foodies cannot get enough of the delicacy, which as well as the traditional variety, comes made from the likes of venison and black faced mutton. Stuart also makes vegetarian and gluten free haggis and extends the theme into haggis pies, pork and haggis sausages and haggis lasagne. It was 5 or 6 years back but Stuart remembers well the day he took the double barrelled Hugh up into the hills near Dalveen Pass on a haggis hunt. The quality of product is just one component of what brings success to JB Houston’s. The door sensor constantly alerts staff to customers entering the shop and as everyone is greeted by their first names it’s apparent that it’s more than a friendly welcome but a welcome to friends. The banter is good and Stuart of his staff of seven have amazing powers of recall to ask their customers how they got on with their previous purchases. This brightly lit modern shop has a fresh smell, surfaces are shining clean and screens flash up the latest special offers and information to customers. There are jars of sweets for the kids to dip into while the adults make their choices. Mince is made to order through a front shop mincer and all the kitchen ready products are sealed into oven proof containers. A separate counter houses the ready to eat meats and pastries, separate slicer and vacuum packer sit beside the wash hand basin. It’s a real struggle to find a weakness, everything is done with meticulous attention the detail. The chill room is large and efficiently laid out with a whole section full of maturing roasts. There is the production room and bakery with stainless steel throughout and the attractive smell of freshly prepared pies. There’s easy access to the car park and it is to there that everything moveable is taken for super efficient steam cleaning to 120°C at the end of the day. Days end at 5.15pm (4.00pm on a Saturday) but from the 7.30am start they are always full and busy ones for Stuart and his seven staff. Stuart is continually concerned about attracting new and younger customers. 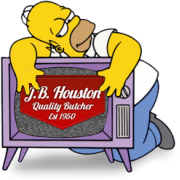 If ever someone repeats that historic phrase – “Houston we have a problem” then the shop goes out of its way to help those new to buying meat for themselves and needing advice. For those that know their cuts there’s a 10% discount on offer for customers spending £50 and with the extensive range and inviting display that meets you in Greenbrae Loaning it’s not hard to earn that discount.